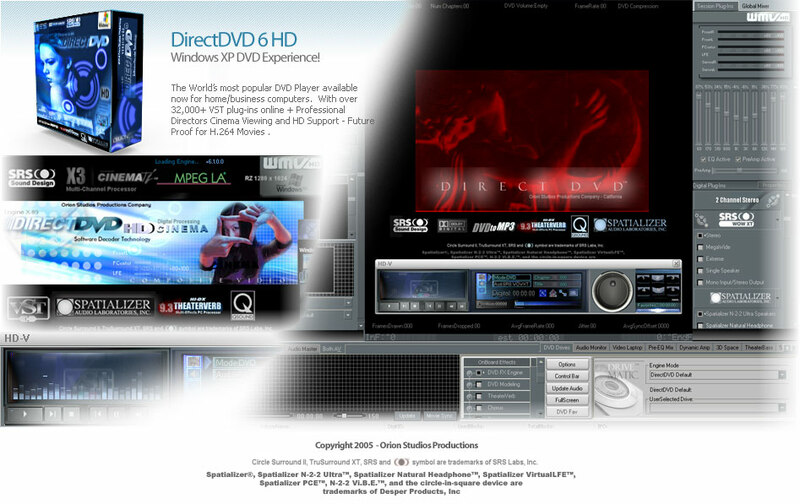 DirectDVD 6 HD is a professional Hollywood DVD Player, includes VST Steinberg Compatible engine, with Spatializer Ultra PC HD, SRS Circle Surround II, and WOWXT. Users can use powerful Audio Modeling and Digital Filters to customize their DVD Experience. Built in MPEG2/MPEG1 Encoding and Windows WMV-HD control panels. Users can control Audio in a 17.1 Mix engine and 32 Band Surround EQ - Full DMO/DirectX Plug-In support. ...... Included Control Panels include Hollywood HX Color, Harddrive Recording, Direct-EQ3, MovieArt, Audio HD, ATI/Hercules Remote Compatible. DirectDVD includes VST to DirectX conversion and Supports all Movie Windows Media Formats AVI,MPEG,MPEG2,VOB,DivX,MP3,MPEG4 and H.264 Future Proof! Developed by Orion Studios Productions. DirectDVD 6 HD allows you to access advanced Navigation and Special Features found on your DVD Discs. Using Advanced Directshow DVD Navigation Filters, Users can easily jump from scenes and titles. DirectDVD 6 HD Support Input Technology From Dolby/SRS/DTS/Sony and other Surround Providers. We provide the strongest support for default import and system required chain builds. DirectDVD 6 HD offers 3D Headphone Technology from SRS Labs - including SRS WOWXT/ SRS WOWHD - Designed for users who want 5.1 surround or 3D type broadcast of AC3/DTS content! Turns your Headphones into a full Theater Event. Convert videos from AVCHD to DV format. Qweas is providing links to DirectDVD 6 HD 6.2.0.4 as a courtesy, and makes no representations regarding DirectDVD 6 HD or any other applications or any information related thereto. Any questions, complaints or claims regarding this application DirectDVD 6 HD 6.2.0.4 must be directed to the appropriate software vendor. You may click the publisher link of DirectDVD 6 HD on the top of this page to get more details about the vendor.